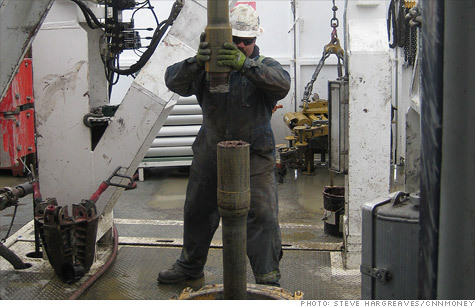 NEW YORK (CNNMoney) -- It may be dangerous, difficult work, but oil drillers are well compensated for the job: In 2011 the average salary for rig workers and other industry personnel was $99,175. That number includes fat paychecks for the highly skilled, like $235,586 for a "drilling consultant" and $139,868 for a "reservoir engineer", according to Rigzone, an industry information provider that compiled the figures. But even for someone with less than a year's experience the average wage was $66,923. A roustabout, one of the lowest workers on a rig who performs general maintenance and physical labor and requires little prior training, made $34,680 -- the median wage for all American workers. "They are desperate," said Michael Durney, an executive at Dice Holdings, Rigzone's parent company. "The industry is starting to look outside its core to fill these positions." And where are they looking? Just about anywhere. Durney said for those with few skills that want a shot on a rig, one strategy is to move to any number of states that are currently seeing a boom in oil and gas production and get a job in logistics -- driving a truck that brings supplies to the rig. For the college-bound, petroleum engineering, geology, or just plain engineering are good areas of study that can lead to lucrative rig work. Demand for college educated rig workers is on the rise. At Houston's Rice University, job postings for the oil and gas industry were up 14% from the year before. "This year we had a career fair, and we literally had to tell companies they couldn't attend," said Nicole Van Den Heuvel, director at the university's career center. "We didn't have enough room." Van Den Heuvel offers familiar advice for college students seeking work in the oil industry: Apply for internships, utilize the university's career center, and network online at places like LinkedIn or in person at industry trade shows. Even the non-science types can get in on the action. "They still need people that can write in communications, in human resources," she said. In fact, office work may be the way to go for some. Rig life is hard. Long hours in desolate locations combined with little to do in the off time make this an industry that many don't stay in for an entire career, said Durney. The tough conditions are one reason why the internet job search site CareerCast ranked oil rig worker as one of the worst professions in 2012 -- just behind journalist.